Look again at the Basic requirements for essays, in Essays. Remember that both essays and commentaries will be marked for 1) content and 2) expression. 1) Make interpretations and arguments — not just summaries and observations. Also, give specific support for your interpretations and arguments. If you say that something occurs in a text, show where, how, and why. Back up your points with specific references to the text. 2) Express yourself grammatically and in the proper format — coherent paragraphs for the commentaries, and the traditional academic structure for the essays. Saying what happens in the text doesn't get you many marks; it merely shows that you've read the text and understand the basic points about it. In writing a commentary, you need to explain and explore the text, making arguments about how it's constructed and what it means. Explain how the text relates to the themes we've discussed in class. Try not to list points, but rather to analyze them in an integrated fashion. The more coherent your commentary is, the better. In this sense a commentary is an essay without the detailed structure of an an essay. A commentary doesn't require an introduction or conclusion, or a clear and integrated relation between a main argument (in the thesis statement) and subsidiary arguments (in topic sentences). A good writer will use more of the unifying features of an essay than will an average writer. In the case of an extremely good writer, there will be very little difference between an essay and a commentary, except that the introduction in a commentary will probably be shorter than in an essay. The meaning of Pound’s poem must take into account the title, since the human and natural images in the two lines are in obvious contrast to the industrial setting mentioned in the title. Where Pound’s metro station is located isn’t clear, yet a quick glance at Wikipedia shows that the poem was written in 1912, and was based on an experience he had in the Concorde metro station in Paris. The generic nature of the location in his title — “a station in the Metro” — doesn’t make the reader think about a particular location — the Louvre or the Eiffel Tower — but about characteristics shared by all metros: technology, noise, crowds, people waiting, cars roaring in and out of the station, sudden gusts of air, etc. Pound creates a contrast by suggesting that the station is a mechanical thing while the faces and petals are natural things. The difference between the station and the people is highlighted by the word “apparition.” This is not a word used for the perception of ordinary things, whether they are static (like a sign reading “Concorde”) or dynamic (such as a car rolling into a station). Rather, “apparition” is a term used for the sighting of a spirit, ghost, or supernatural being. Pound thus suggests that he sees the petal-like faces as entities on a different, perhaps higher, plane. Whether this higher plane is emotional, spiritual, or aesthetic is not specified. Another possibility is that Pound suggests a comparison or similarity between the station and the people. Just as the station is one entity composed of many elements, so the people in the crowd are one entity. The mechanical world of the station might even be seen as a living, breathing entity — a bough of people with petal faces. In this case, the ‘lower’ physical and the ‘higher’ emotional levels become blended on the aesthetic level, that is, in the perception of beauty. The petals are neither mechanical nor human, and can therefore serve as an aesthetic medium connecting the inert to the living. Perhaps Pound is suggesting that if we can transform anonymous faces into petals, we may be able to transform a subway station into a place of beauty. Pound leaves us the choice—to be apart from, or to be a part of, the industrial world around us. The ambiguity of his imagistic, concrete poetry allows for either interpretation. Yet one thing is sure: in order to appreciate his poem, we must take an active role in discovering its meanings. Unlike many of the ads we might see on a subway platform, these twenty words do not urge us to buy something, but to think about the possibility of beauty in the world around us. “Three Panel Review” is a comic version of Hamlet by Lisa Brown. The main characters in the comic strip are 1. 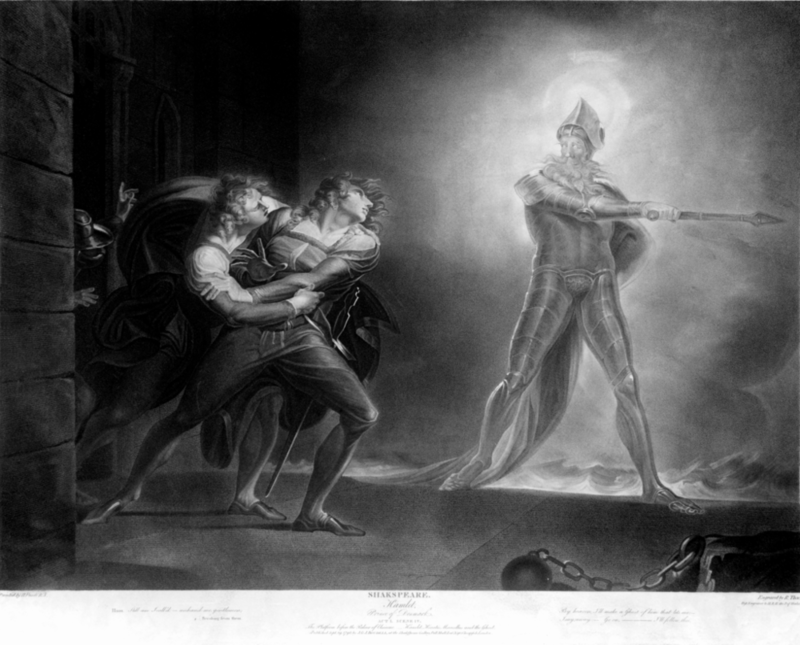 Hamlet’s father, who appears to Hamlet as a ghost and tells him that his brother Claudius has killed him, 2. Hamlet, who questions whether or not he should kill his uncle Claudius (he fears that his father’s ghost may be a demon), and 3. Claudius, who Hamlet finally realizes is guilty of killing his father. Moving from the first to the second panel, we go from night to day (as in the play), and yet the white of the ghost in the first panel is echoed in the second panel by the white skull (of Hamlet’s childhood friend, the jester Yorick). Both the ghost and the skull are reminders from the world of the dead. Brown thus manages to supply details that hint at complexity while at the same time she reduces that complexity in an absurd and humorous manner. The simplicity of Brown’s final panel is also at comic odds with Shakespeare’s play. In the original, Hamlet’s friend Horatio warns him to pay attention to his misgivings about avenging his father’s murder. Hamlet responds, “We defy augury. There’s a special providence in the fall of a sparrow” — a reference that goes back to Matthew 10:31 in the Bible. When Hamlet finally does act, it’s the culmination of a long and intricate process of rejecting alternative courses of action. The more one knows about the complexity of the original play, the more humorous Brown’s reduction becomes. Other details hint at complexity. The wine cup in Hamlet’s hand is a direct reference to the complicated scheming of the king, who tries to poison Hamlet, but poisons his wife instead, and then is forced to drink the poison himself. 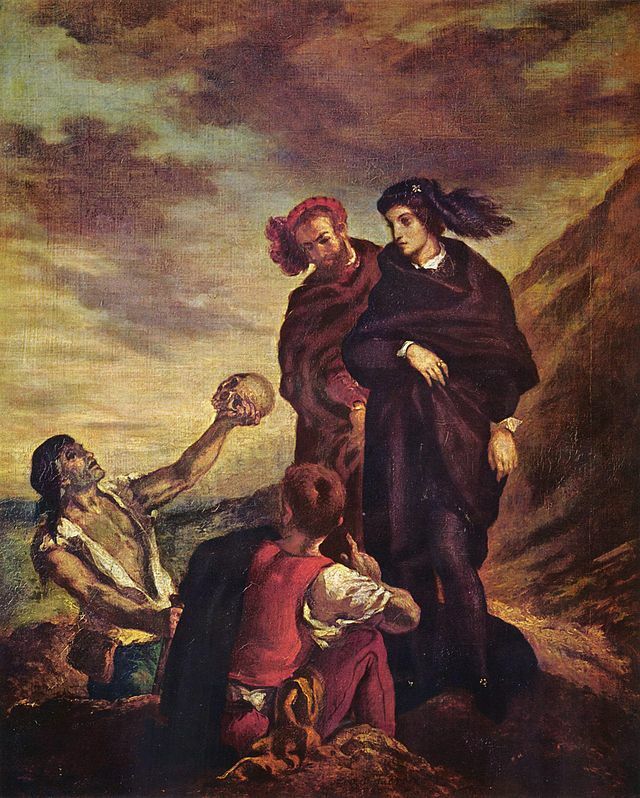 The king’s kneeling stance represents his desperate present situation, yet could also refer to his earlier attempt to pray at an altar for his sins — at which point Hamlet decides to spare his life. At the end of the play, however, Hamlet has no such second thoughts: he will instantly send his uncle to the fires of hell. Brown’s final triumph, her final incongruity or reversal of expectations, is that while the play ends on a deeply tragic note — meaningless slaughter, bodies piled on top of each other on the stage — the comic strip leaves us laughing. The protagonist of Hamlet is Prince Hamlet of Denmark, son of the recently deceased King Hamlet, and nephew of King Claudius, his father's brother and successor. Claudius hastily married King Hamlet's widow, Gertrude, Hamlet's mother, and took the throne for himself. Denmark has a long-standing feud with neighboring Norway, in which King Hamlet slew King Fortinbras of Norway in a battle some years ago. Although Denmark defeated Norway, and the Norwegian throne fell to King Fortinbras's infirm brother, Denmark fears that an invasion led by the dead Norwegian king's son, Prince Fortinbras, is imminent. On a cold night on the ramparts of Elsinore, the Danish royal castle, the sentries Bernardo and Marcellus and Hamlet's friend Horatio encounter a ghost that looks like the late King Hamlet. They vow to tell Prince Hamlet what they have witnessed. As the court gathers the next day, while King Claudius and Queen Gertrude discuss affairs of state with their elderly adviser Polonius, Hamlet looks on glumly. After the court exits, Hamlet despairs of his father's death and his mother's hasty remarriage. Learning of the ghost from Horatio, Hamlet resolves to see it himself. As Polonius's son Laertes prepares to depart for a visit to France, Polonius gives him contradictory advice that culminates in the ironic maxim "to thine own self be true." Polonius's daughter, Ophelia, admits her interest in Hamlet, but both Polonius and Laertes warn her against seeking the prince's attention. That night on the rampart, the ghost appears to Hamlet, telling the prince that he was murdered by Claudius and demanding that Hamlet avenge him. Hamlet agrees and the ghost vanishes. The prince confides to Horatio and the sentries that from now on he plans to "put an antic disposition on," or act as though he has gone mad, and forces them to swear to keep his plans for revenge secret. Privately, however, he remains uncertain of the ghost's reliability. Soon thereafter, Ophelia rushes to her father, telling him that Hamlet arrived at her door the prior night half-undressed and behaving crazily. Polonius blames love for Hamlet's madness and resolves to inform Claudius and Gertrude. As he enters to do so, the king and queen finish welcoming Rosencrantz and Guildenster, two student acquaintances of Hamlet, to Elsinore. The royal couple has requested that the students investigate the cause of Hamlet's mood and behavior. Additional news requires that Polonius wait to be heard: messengers from Norway inform Claudius that the King of Norway has rebuked Prince Fortinbras for attempting to re-fight his father's battles. The forces that Fortinbras had conscripted to march against Denmark will instead be sent against Poland, though they will pass through a portion of Denmark to get there. Polonius tells Claudius and Gertrude his theory regarding Hamlet's behavior, and speaks to Hamlet in a hall of the castle to try to uncover more information. Hamlet feigns madness but subtly insults Polonius all the while. When Rosencrantz and Guildenstern arrive, Hamlet greets his "friends" warmly, but quickly discerns that they are spies. Hamlet becomes bitter, admitting that he is upset at his situation but refusing to give the true reason why, instead commenting on "what a piece of work" humanity is. Rosencrantz and Guildenstern tell Hamlet that they have brought along a troupe of actors that they met while traveling to Elsinore. Hamlet, after welcoming the actors and dismissing his friends-turned-spies, plots to stage a play featuring a death in the style of his father's murder, thereby determining the truth of the ghost's story, as well as Claudius's guilt or innocence, by studying Claudius's reaction. Polonius forces Ophelia to return Hamlet's love letters and tokens of affection to the prince while he and Claudius watch from afar to evaluate Hamlet's reaction. Hamlet is walking alone in the hall as the King and Polonius await Ophelia's entrance, musing whether "to be or not to be". When Ophelia enters and tries to return Hamlet's things, Hamlet accuses her of immodesty and cries "get thee to a nunnery," though it is unclear whether this, too, is a show of madness or genuine distress. His reaction convinces Claudius that Hamlet is not mad for love. Shortly thereafter, the court assembles to watch the play Hamlet has commissioned. After seeing the Player King murdered by his rival pouring poison in his ear, Claudius abruptly rises and runs from the room: for Hamlet, proof positive of his uncle's guilt. Gertrude summons Hamlet to her room to demand an explanation. Meanwhile, Claudius talks to himself about the impossibility of repenting, since he still has possession of his ill-gotten goods: his brother's crown and wife. He sinks to his knees. Hamlet, on his way to visit his mother, sneaks up behind him, but does not kill him, reasoning that killing Claudius while he is praying will send him straight to heaven while his father's ghost is stuck in purgatory. In the queen's bedchamber, Hamlet and Gertrude fight bitterly. Polonius, spying on the conversation from behind a tapestry, makes a noise. Hamlet, believing it is Claudius, stabs wildly, killing Polonius, but pulls aside the curtain and sees his mistake. In a rage, Hamlet brutally insults his mother for her apparent ignorance of Claudius's villainy, but the ghost enters and reprimands Hamlet for his inaction and harsh words. Unable to see or hear the ghost herself, Gertrude takes Hamlet's conversation with it as further evidence of madness. After begging the queen to stop sleeping with Claudius, Hamlet leaves, dragging Polonius's corpse away. Back at Elsinore, Hamlet explains to Horatio that he had discovered Claudius's letter with Rosencrantz and Guildenstern's belongings and replaced it with a forged copy indicating that his former friends should be killed instead. A foppish courtier, Osric, interrupts the conversation to deliver the fencing challenge to Hamlet. Hamlet, despite Horatio's pleas, accepts it. Hamlet does well at first, leading the match by two hits to none, and Gertrude raises a toast to him using the poisoned glass of wine Claudius had set aside for Hamlet. Claudius tries to stop her, but is too late: she drinks, and Laertes realizes the plot will be revealed. Laertes slashes Hamlet with his poisoned blade. In the ensuing scuffle, they switch weapons and Hamlet wounds Laertes with his own poisoned sword. Gertrude collapses and, claiming she has been poisoned, dies. In his dying moments, Laertes reconciles with Hamlet and reveals Claudius's plan. Hamlet rushes at Claudius and kills him. As the poison takes effect, Hamlet, hearing that Fortinbras is marching through the area, names the Norwegian prince as his successor. Horatio, distraught at the thought of being the last survivor and living whilst Hamlet does not, says he will commit suicide by drinking the dregs of Gertrude's poisoned wine, but Hamlet begs him to live on and tell his story. Hamlet dies in Horatio's arms, proclaiming "the rest is silence". Fortinbras, who was ostensibly marching towards Poland with his army, arrives at the palace, along with an English ambassador bringing news of Rosencrantz and Guildenstern's deaths. Horatio promises to recount the full story of what happened, and Fortinbras, seeing the entire Danish royal family dead, takes the crown for himself, and orders a military funeral to honor Hamlet.